Finnish handset vendor Nokia revealed what it’s been up to with location and mapping firm Navteq which it bought in 2008 for $8.1bn. The monster handset vendor is shaking up the mobile space by making mapping and turn by turn navigation available for free to a potential 83 million users. The big attraction with this new service is that the maps are available in on and offline mode. They can either be downloaded on the fly over cellular or wifi, or sideloaded in advance from the PC. Any maps that are downloaded are also cached so they don’t need to be downloaded again, and this goes for all the maps available for 180 countries. The service also features car and pedestrian navigation features, such as turn-by-turn voice guidance for 74 countries in 46 languages, and traffic information for over ten countries. Through a partnership with Facebook, Nokia has also introduced a ‘share my location’ feature to use with the social networking service. 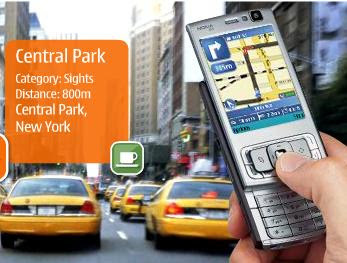 From today, ten Nokia models will be able to download the new version of Ovi Maps as a free update; the N97 mini, 5800 XpressMusic, 5800 Navigation Edition, E52, E55, E72, 5230, 6710 Navigator, 6730 classic and X6. Going forward, all Symbian S60 devices released by Nokia will boast this same functionality and the vendor will later make Maps available on its Linux-based Maemo platform. Devices will come preloaded with regional maps out of the box. The news threatens to destroy the PND (portable navigation device) market, and also sticks the boot into any other paid for navigation offerings. It also makes an attractive alternative to offerings like the iPhone, which boasts native mapping using Google Maps, but does not allow for caching or offline usage. Nokia’s proposal allows the user to sidestep heavy data roaming charges by preloading maps before they visit a county and just using GPS, which is free, rather than the data network to find their location when abroad.